Alpha has started. Hallelujah. Sprint 1 notes. Today’s my last day as Head of Social Media at ONS. A stint of 2 years, 1 month and 25 days commuting between Bradford on Avon and Newport has finally taken its toll. 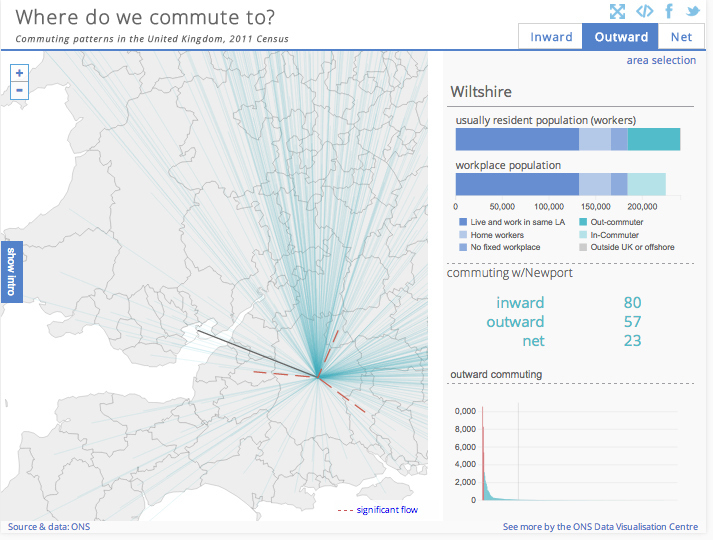 Unsurprisingly, it’s not a common commuting destination from Wiltshire according to this data vis on commuting patterns. I’m taking a role at Innovate UK in Swindon. Still a bit of a hike, but not quite as far and about half the cost. It’s a broader role than just social as well, which I was conscious couldn’t become all that I was known for. I freelance at a local charity to keep other digital skills sharp which has been a total privilege, but the time has come to pull everything together to one full time role. I’d like to think the team and I have ONS’ social media in better shape than when I started, when things were more reserved and cautious. Also, props to the content guys at ONS who set up around the time I joined, making all the stuff in this blog so much easier to do. 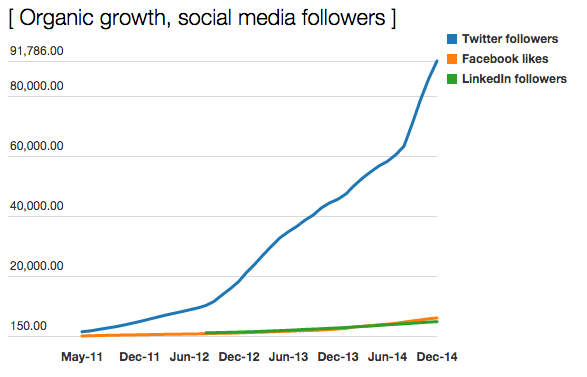 Engagement, reach and followers have all gone up, with no ad spend < Twitter has really matured for us. We’re not the right brand for Facebook, but have had some good wins to the extent our organic reach is going up, when the global trend seems to be the other way. We tried google+ which didn’t work and even thought about WhatsApp. It would have been nice to branch into Pinterest but it didn’t feel like the return would be there for us. Live tweeting along to the Autumn Statement < ONS’ role is to inform debate. So pointing to already published content is an obvious thing to do, although it treads a fine line with political debate and forecasting which we don’t engage in. Piggyback TV programming < hands down our engagement peaks and gives existing content a fresh audience. We don’t get involved in the content progamming which cites different sources to suit its editorial direction. Opportunity for ONS to get closer to that to then reap better, integrated, social media executions? Q&As < some work, some don’t and this largely depends on the stats being standout. Opportunity to build something more consistent, like #ODIFridays? Tweeting statistians < Social mediaing professionally as individuals isn’t natural at ONS, unfortunately. It’s working for about 10 statisticians. Others have fallen by the wayside. But this community is growing as newbies learn of the rewards to be gained. It’s quality over quantity with this but has been really labour intensive for me which is a common theme for the open policy community across government which I guess is the closest comparison. I’ve done a couple of talks lately, one at Scottish Government and another at #SoMeSW, where I summarised what the team does and shared what we’ve found to work for us. The latter also included a bit about my time at 10 Downing Street. Lauren and Gareth, the two remaining in the social media team, are great and can handle things no problem at all. This is the next big social media leap for ONS I think. As I alluded to above, it’ll take time and some serious graft. I guess there are several ways to approach it but it feels to me the trick is to make it part of a statistician’s day-to-day work. Social customer service is part of what the team does well. A natural progression to it is assigning the query to the statistician in Hootsuite to respond from their own Twitter account, which they do. The tricky bit is to take things one step further and have them proactively looking out for and engaging in discussions and being always on. My central team can’t be across everything, nor do we know the intricacies of the subjects well enough. We’ve only really got going with this. It stalled because our last supplier, Topsy Pro, got bought by Apple who terminated existing contracts. Since then trialling and appraising alternatives has taken time. I decided on Brandwatch. It’s not the most intuitive, but persevere for a couple of weeks and you’ll see why we bought it. Its integration with Hootsuite is a real bonus too. On a more pragmatic note, Brandwatch were the only supplier to offer unlimited mentions which sat better for us given how widely our topics are discussed, though ‘mainstream’ mentions tend to be around whichever Whitehall department’s policy, rather than our stats. If it’s useful, here’s Rebecca Carson from Brandwatch talking about evolution in this space. Like I say, we’ve only got going with monitoring. Right now, we’ve got the searches sorted, but it’s what we do with it that’s the big opportunity, I reckon. Because social isn’t high on everyone’s agenda at work, a daily summary of those queries filtered by lists of political, policy and journalist types gets sent around each afternoon. It takes about 20 minutes to make the summary. Because we focus on statty mentions, volume isn’t massive. Broaden it and there’d be some awesome opportunities and more robust insight (like the work Jamie does at Food Standards Agency) to be gleaned. Planning for the next census is warming up. A perfect opportunity? In the meantime, Gareth did a fine job on analysing the social reaction to alpha.ons.gov.uk and Lauren keeps a close eye on the performance of the content we put out. We tagged urls we posted on social for a time so we could see what messages / content / subject drove the most time on site (at the time, our best equivalent to a conversion). Hootsuite / Webtrends integration, then tableau visualisation saw to that. ONS will start using Google Analytics soon which should offer up better insight. Brandwatch can API into Google Analytics which could make for some great integrated dashboard action. Anyway, copy formats introduced 18 months ago seem to be working and is the value the team add to draft content passed our way; to add the last bit of polish to content and editorially judge how, when and if things should be posted. ONS feeds the news cycle, has content to be authoritative in trending social media topics, and is a repository for masses of content that stats folk use to inform / make their work. As such, my team haven’t done any long term campaigns. That’s not to say we shouldn’t, it’s just not been a priority for a thinly stretched team. Our users are niche and we engage with them directly, which is weird given how much coverage our content gets. This sort of thing would be led by the comms guys who, organisationally, sit separately to us. ONS’ social media team sits in digital, rather than comms. It was something I pushed for soon after I started here and not surprisingly splits opinions. It’s allowed social media at ONS the space to be progressive, be really close to the user-focused digital content being created and contribute insight to what we know about these users. “Rather than Facebook and Twitter executions, the focus will be on understanding social behaviour, creating ideas that people want to share, talk about and get involved with. “Instead of surviving on one-off campaigns, brands need to create ongoing storytelling to be visible within this data driven world. Content creation is no longer enough. “We will see a change in the form of collaboration between brands and influencers, from the one shot outreach approach (mainly earned media) to a more structured partnership model (mainly paid media) where the two parties can collaborate regularly to co-create a long term narrative. “If 2014 has been the year of content creation, 2015 will be the year of content ROI”. Whoever takes this job on, good luck. It’s a great role with a lot of opportunity to make your mark. If you want to meet for a beer, just shout. Social media has become a successful staple for ONS and we have a lot of users who appreciate the service which in the fickle social media world, is no mean feat.